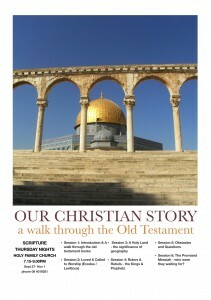 Our Christian Story – A Walk Through the Old Testament is a scripture course shared with the Kerikeri Parish. The resources will be available online for the duration of the course. The powerpoint presentation is downloadable in pdf format for each session. A recording of each session is also available for download. For details of sessions and times click on the poster.